Chill with a Book Award – Book of the Month! Well, I have the first draft completed. And a very rough effort it is. But, you can’t edit an empty page, and now the fun begins. Here’s a peek at the characters in the final novel in the trilogy, and a preliminary blurb. With the stroke of an axe, England’s Civil War is won, and in the aftermath of violence, three women begin to rebuild their lives. Luce, whose rebellion against the king gave her victory. Frances, who faces poverty and exile. And Nan, the spymistress who chooses whichever side suits her own ambitions. This is the true story of three cousins, with divided loyalties and a united love for family and the men they married. Can they overcome fate and create their own destiny? The final book in The Lydiard Chronicles, Destiny’s Women (Working Title) completes the trilogy of The Lady of the Tower and By Love Divided. 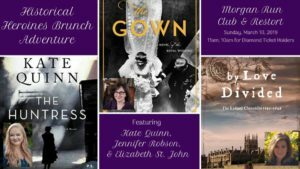 Excited to be part of “Historical Heroines” with Jennifer Robson Crespi, a right royal novelist, and Kate Quinn, who just hit the 1 million bestseller mark with The Alice Network and is launching The Huntress later this month! We’ll be talking about our historic heroines – mine, for one, was a poet, a scholar, practiced medicine – and pretty much single-handedly defended Nottingham Castle against a marauding Royalist army. Hope to see you there! 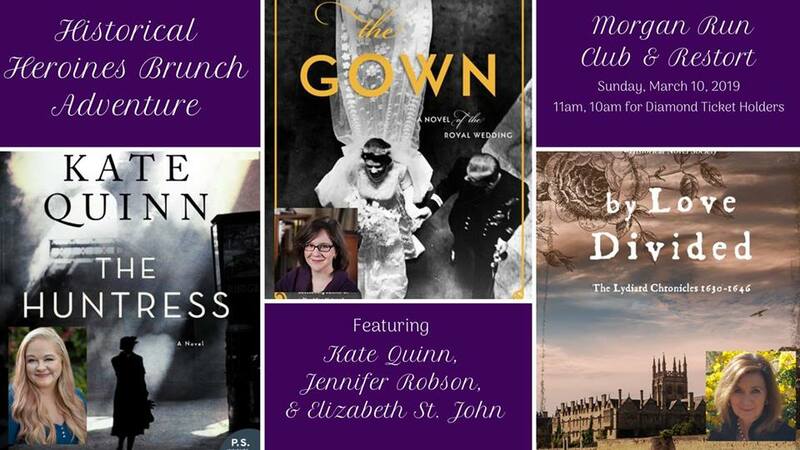 I’m excited to be in New York February 7, as a guest of Historic Royal Palaces and the English Speaking Union to give a talk about the Lady of the Tower. 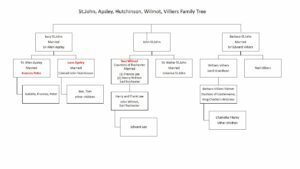 Lucy St.John’s life as the Keeper’s Wife was fascinating, and the original idea behind my book. 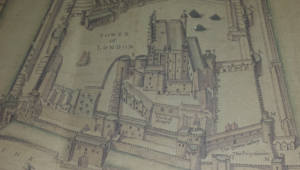 I’m really looking forward to sharing my findings and insights on life as a resident of the Tower of London during one of the most tumultous times in English history. Here’s a link to the event and ticket information. 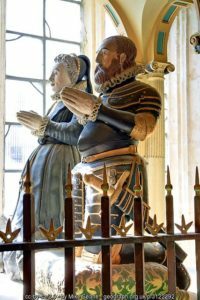 Biographical historical fiction can be incredibly demanding at times, and although I adore writing in this genre, the parameters of time and place can sometimes bind. 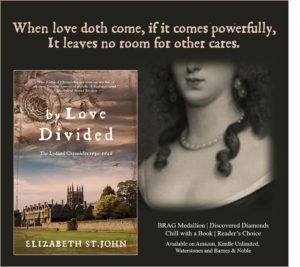 SO, when I was invited to write a short story for Discovering Diamonds, I decided to depart the pattern and write a historical romance. And, I enjoyed it so much, I think I might write more in 2019. So, with the collaboration of my daughter, Emma Craft, who writes a dynamite premise and is a superb grammarian, look out for more from Julia Darke, my historical romance pen name. Oh, and how did the name come about? I’m honoring my Irish grandmother, who was orphaned during the famines, raised in a Carmelite convent, and married the love of her life. 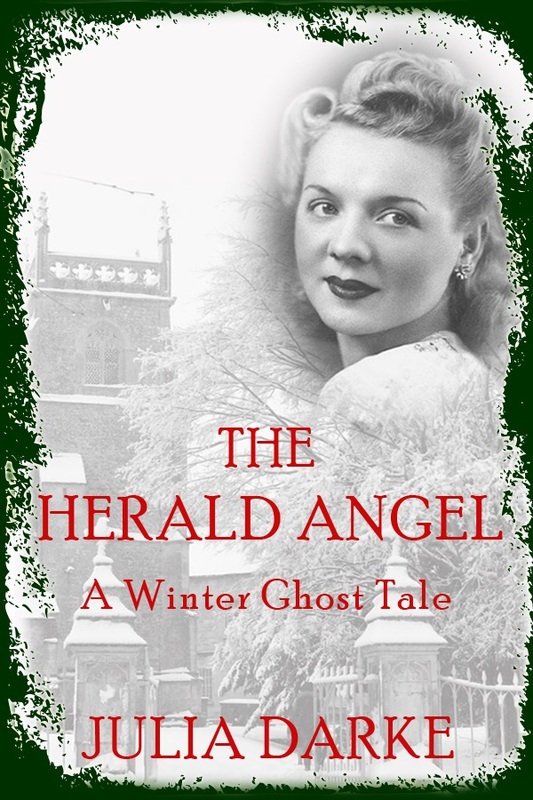 Under her name, I am writing the alternative stories of my ancestor’s lives. After all, everyone deserves a Happily Ever After. And who better than an orphan to create one? 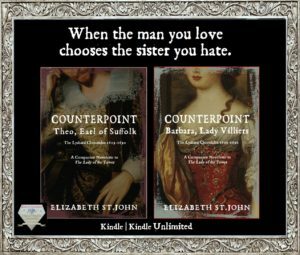 The Counterpoint Short Stories are a light-hearted look at some of the characters you encounter in my full-length novels. Please enjoy as a quick read, perhaps see a different perspective to their personalities, or find an introduction to my writing. I love hearing from readers, so do drop me an email, leave a review on Goodreads, and pass on to a friend! 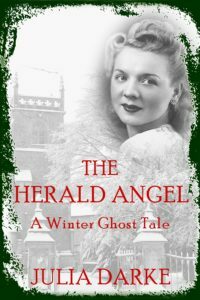 When I first approached writing an historical fiction novel based on an ancestress’s diary fragment, my biggest challenge was not in the prose (that came later!) but in establishing which parts of the work would be truth, and which I would dare to fictionalize. 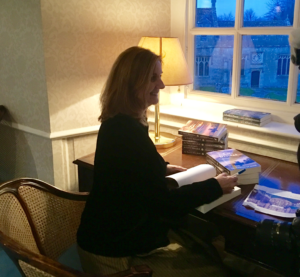 After re-reading some of my favorite historical fiction authors (Hilary Mantel, Jean Plaidy, Anya Seton, George Garrett, Margaret George) I felt I had a good handle on how to navigate those dangerous waters. What I didn’t want, more than anything, was to be caught in an obvious fabrication of the facts, twisted to suit my own needs. So, truth based in fact, and dare to be bold in interpreting emotions, motive and outcomes. That was a rule I established and scrutinized my writing against every day. Going a step further, I decided that I would approach my research from two perspectives. Firstly, immersively, where I would read any and every fiction and non-fiction book that caught my eye that was relevant to the period. 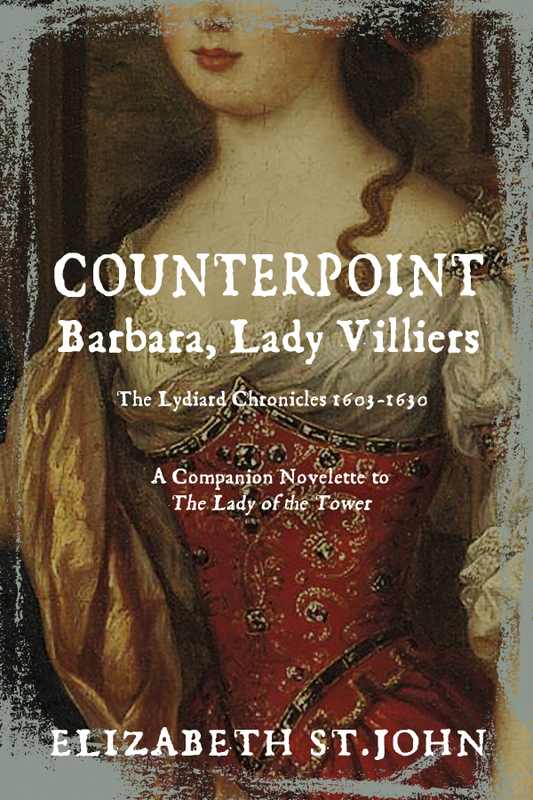 I was fairly widely read in the preceding 16th century, but most of the action in The Lady of the Tower takes place in the 17th century. I needed to brush up on my Stuarts. This involved a voracious consumption of the driest text books (try Divine Right and Democracy – An Anthology on Political Writing in Stuart England) to the wonderful biographies of Antonia Fraser, Anne Somerset, Paul Sellin, and Roger Lockyer, to reams of good (and not so good) fiction. What was most fascinating to me were the footnotes, for from there emerged the original source documents. That was my second research methodology – going deep into the contemporary documents of the times. Subscribing to British History Online and the National Archives opened up the world of digitalized manuscripts; and Google Books unlocked the Calendars of State Papers. Now I was humming! The hunt was on for every single character that would be making an appearance in my book, and the riches provided by these online sources were boundless. I quickly realized the need to have a pretty accessibly filing system to be able to store and retrieve all the documents that were emerging – letters, pleadings, court appearances, dispatches. Some were written by my characters; others mentioned them in passing. Each provided a clue to the personality and motivation of the people of my book. Now I could read their own words, or speeches that had been transcribed by clerks, and plot their character arcs. I could start to see why one married another, or how Barbara would always be a survivor, and Eleanor was a sweetheart. I was fortunate to have access to family portraits, and as I wrote, I chose desktops and images to constantly rotate on my computer to inspire me. Each day, they became more real, and their voices more insistent to be heard. The research that I had done fell into the background, a foundational knowledge that dared me to now allow my imagination to take flight, knowing that I had solid groundwork in accurate fact. Next – the landscapes. I am fortunate inasmuch as having been brought up in England, so my sense of the countryside and climate are innate. But, I still didn’t know how long it would take to ride from Swindon to Castle Fonmon, and the route, and the scenery along the way. This is where Google Maps came in so handy – sitting at my desk in San Diego, I could drop into a footpath in Wiltshire and know exactly how my heroine would have seen the land. More than anything I felt I owed it to my distant family to bring them to life in an honest account that would retain the atmosphere of the time, without making the writing too inaccessible to the modern reader. This is where, after several false starts, I determined Point of View (First) and a reading / language level that would appeal to my potential audience. I knew I wasn’t writing romance (although there are love stories intertwined), and I didn’t want twenty-first century attitudes and language to creep in. I settled in on…Jane Eyre. Although written a couple of centuries later than the period of The Lady of the Tower, I felt the sentence structure helped convey a sense of an earlier time, while the restrained passion in the writing and the heroine’s character make us relate completely to her and her plight. Of course, lengthy run-on sentences suffered greatly in the editing, but they were fun to write in the first draft. Finally, I have a confession. Back to the original diary fragment, I had a big problem. Mention is made of the heroine’s first love in the following way…describing his arrival as such… “all the suitors that came turned their addresses to her, which she in her youthful innocency neglected, till one of greater name, estate and reputation than the rest happened to fall deeply in love with her, and to manage it so discreetly that my mother could not but entertain him…”. The problem – his name was never mentioned. So I had a pivotal plot point in the book, but no character’s name. Back out came the research, and after a few weeks of digging around, I found an estate (Charlton Park) close by the location of my work, and a young man (Theophilus Howard, future Duke of Suffolk) that could match the hero. Then, I found that two of his children married into my heroine’s family. That, to return to Hilary Mantel’s credo, was enough fact to establish plausible conjecture. And thus, “Theo” was born. To summarize, writing this work of historical fiction has been a glorious journey. I’ve read extraordinary books, delved into personal correspondence and diaries, visited their houses, castles, graves, and gardens, and gazed at portraits, daring the sitters to walk out of their frames and talk to me. And, during the three years that it took to write, edit and prepare The Lady of the Tower for publication, I felt that I had honored my ancestors and written a piece that brought them to life. As I say in my summary for the book … it may have been four hundred years ago, but they are not so different from you and me. 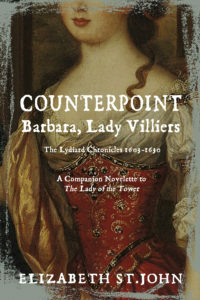 Barbara Villiers Palmer is one of the most famous courtesans in history. Mistress to Charles II and mother of five of his children, Lady Castlemaine’s notoriety is legendary. 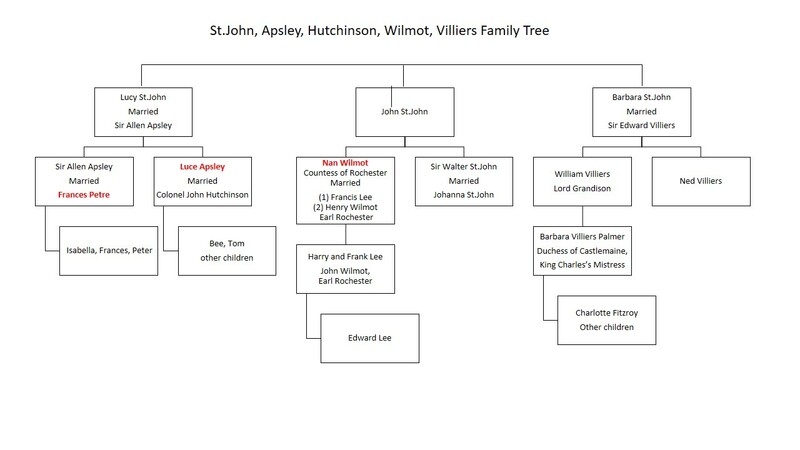 This is the story of her namesake and grandmother, Barbara St.John Villiers. The apple did not fall far from the tree. 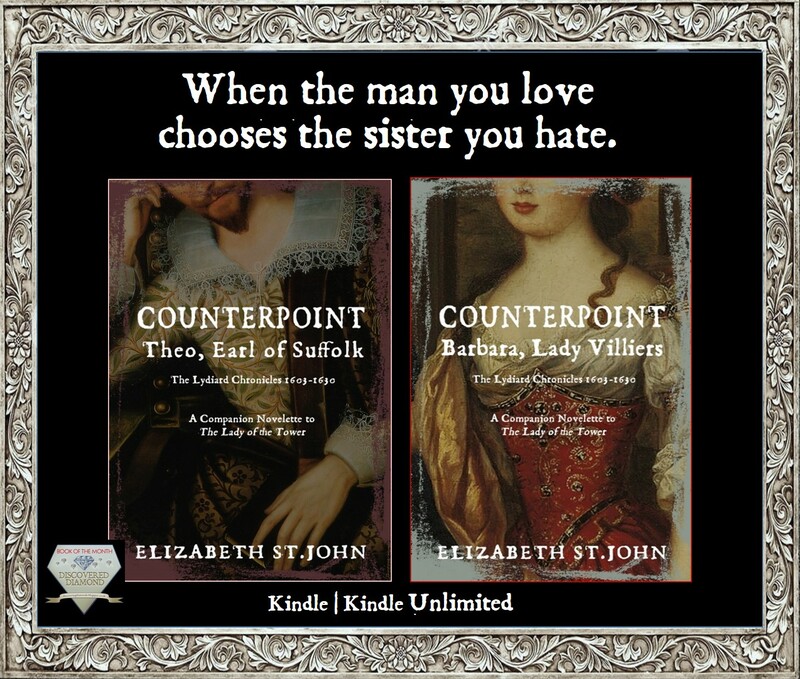 Barbara St.John Villiers has always despised her sister Lucy, and when Theo Howard, Earl of Suffolk, fell in love with her, Barbara thought she’d die of jealousy. Instead, she decided to get even by befriending someone even more scandalous than herself, Theo’s sister, Frances Howard, Countess of Somerset. 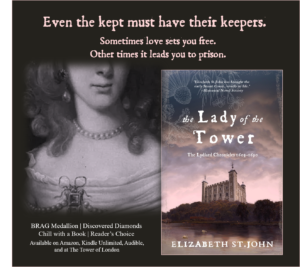 Unfortunately, Frances was then imprisoned in the Tower of London, accused of murder, and Barbara had to find a way to turn this to her advantage – and continue her vendetta against Lucy. 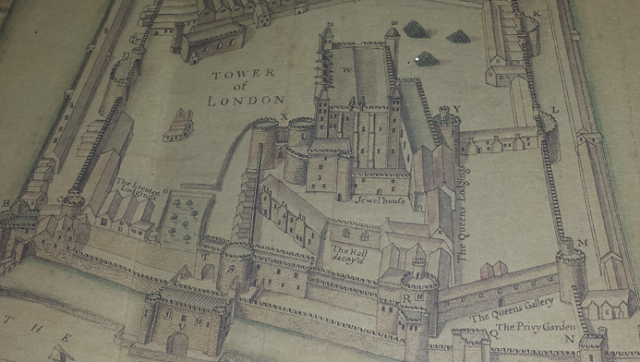 What was it like to live in the Tower? Elizabeth J St John Copyright © 2015 - 2019 All Rights Reserved.